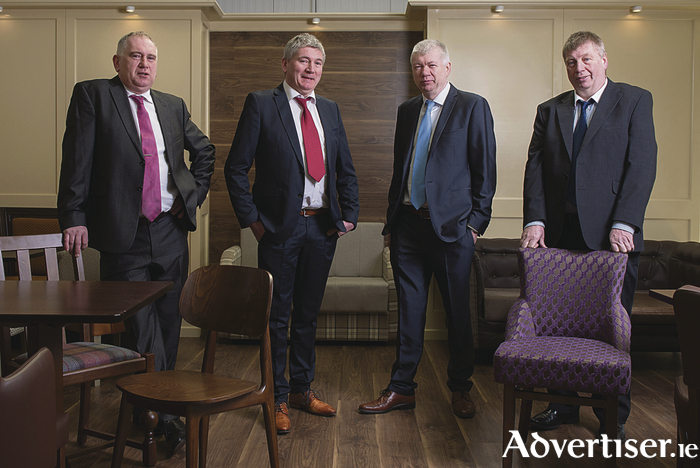 Richard, Michael, Peter, and Paddy Monaghan of Monaghan Bros Bar Furniture Manufacturers Ltd from Mayo Abbey. Monaghan Bros Bar Furniture Manufacturers Ltd from Mayo Abbey in Mayo, has been officially announced by the Minister for Jobs, Enterprise and Innovation, Mary Mitchell O’ Connor, as a finalist in this year’s National Enterprise Awards. Organised by the Local Enterprise Offices, the 2017 National Enterprise Awards celebrate the achievements of Ireland’s top small businesses and micro-enterprises from all parts of Ireland in a showcase of enterprise, innovation, and ambition at Dublin’s Mansion House on May 25. The Mayo finalist, Monaghan Bros Bar Furniture Manufacturers Ltd, was set up in 1987 and specialises in manufacturing standard and custom made furniture for the hospitality industry in Ireland, Europe, Australia, and the USA. The company will be represented at the National Enterprise Awards on May 25 by Peter Monaghan. In 2011 Ballyhaunis based company Running Gear (Trading as Agrispread ) was overall winner of the National Enterprise Awards. The company manufactures a wide range of agricultural machinery primarily for the export market. Last year another Ballyhaunis based company, Big Red Barn, was regional winner at the awards. The company manufactures event structures and modular buildings. The winners of this year’s National Enterprise Awards will be announced at the Mansion House in Dublin on Thursday, May 25. Twelve awards will be presented including eight regional awards. The overall winner will receive €10,000 to invest in his/her business. Page generated in 0.1584 seconds.